Text and Photos © 1992, 1996 Chris I. Lizza. All Rights Reserved. Chacaltaya superlatives: The highest ski area in the world. The only ski area in South America outside of Chile and Argentina. The most equatorial ski area in the world. The oldest ski lift in South America. The fastest surface lift in the world. The northernmost ski area in South America. The only ski area in South America with a season that corresponds to that of North America. The most difficult lift to load in the world. Chacaltaya. 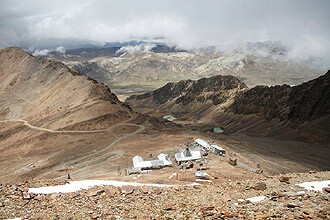 Chacaltaya's lift ascends the middle of a year-round snowfield high above the elevated altiplano of Bolivia. 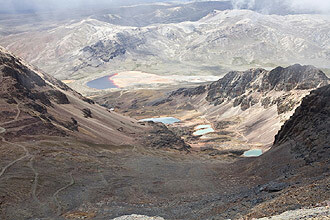 The top of the mountain is near 5,570m (18,275ft), and the lift ascends to a point perhaps 150m (500ft) below the summit. The slope itself is mostly intermediate, but combine the slope with the rarified air and the ski area suddenly rates advanced. When the complexities involved in loading Chacaltaya's antiquated lift are factored in, this ski area is for experts only. Chacaltaya is located in Bolivia's Cordillera Real. Although it is a year-round snowfield, the lift is generally open only during the rainy season. Skiing can be found as early as mid-September though. During the colder dry season, the snow is too hard and icy for safe skiing. Even in-season, the lift and bus only operate on weekends. The tow lift is merely a speeding cable that begins its triangular course from the power shed to the bottom of the lift high in the air. It then passes over about seven wooden towers (with old tire rims for sheave support) on its quick trip to the top before descending, again well above the run, back to the power shed. The cable runs at about the same speed as a modern detachable chairlift. Before attempting to load the lift, skiers must familiarize themselves with the hauling apparatus. This crucial piece of equipment will stay with the skier for the duration of the day. It consists of a bent piece of rebar-type iron tied to a lengthy piece of knotted and frayed rope with a poma-type platter attached to the other end. The whole thing is about 2m (6ft) long and can be wrapped around the skier's waist when descending. To load, hold the hook over the cable (pointing uphill), and allow the cable to zip freely in the U-shaped groove. When you feel comfortable, lock the hook onto the cable by pulling tension on the rope making sure your fingers are clear. This will not work if the skier is seated on the platter as the length of the rope is too great. As you zoom away, hang on to the rope with your hands, and slowly ease yourself back onto the platter. The key is to maintain constant tension on the rope to sustain its bight on the cable. Whenever this tension is released, the hook will fly off the cable, and the skier will have to try again. Try it without ski poles if experiencing difficulties. To unload, simply flip some slack onto the rope, or just drop it. The main run is located between the refugio and the lift and is called Pista Central Slalon (sic). There are a few little chutes on the other side of the lift for greater challenges. Nearly everyone skis on the left side of the lift. The track can be difficult to cross and is easiest at the top as the cable ascends to the bullwheel. Do not ski below the bottom of the lift as the snowfield feeds into a cliff. It is possible to hike a bit for a longer run, but rough snow and high altitude make the effort pointless.